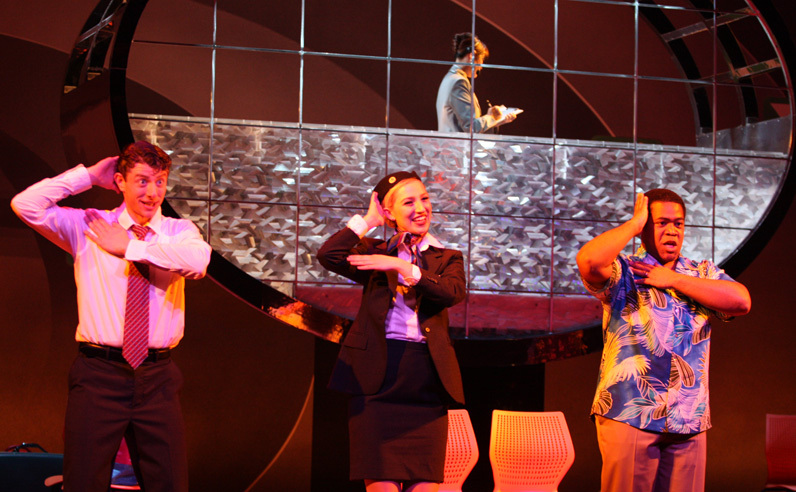 Sean Sullivan as the Steward, Maya Yahav Gour as the Stewardess and Terrence Chin-Loy as Bill star in Mannes Opera and Parsons School of Design's co-production of Jonathan Dove's Flight. It’s the sort of announcement that makes travelers cringe. But for viewers of Mannes School of Music and Parsons School of Design’s co-production of Flight, Jonathan Dove’s three-act opera, that notice had the opposite effect. The interruption meant more time to experience the wit, romance, frivolity, and introspections of Dove’s passengers, played masterfully by students from Mannes Opera. This was one delay audience members didn’t mind sitting through. The performance, which was conducted by Joseph Colaneri and directed by Laura Ashley, marked the latest collaboration between Mannes, whose orchestra and opera students performed the piece, and Parsons, whose design and fashion students helped create the costumes and sets. For Richard Kessler, executive dean for the Performing Arts, the performance reflected The New School’s focus on multidisciplinary education and collaboration. “Today we view our operatic co-productions with Parsons School of Design as the vanguard of what’s possible when you combine Mannes music education with other vital disciplines—in this instance, the field of design,” Kessler said. As the curtains parted, viewers were immersed in the surreal, dreamlike dystopia of Dove’s airport terminal. The Controller (Chae Seon Kim) sat perched in her tower, a raised polymer-plated structure that is the creation of longtime set designer Roger Hanna. Parsons students made their mark as well. Under the direction of faculty member John Jerard, they designed a giant turnstile made of plywood decks and wrapped in a sheet of polystyrene, as well as counter and rolling units, both of which were great hiding places for the actors. Fashion designers led by faculty member Alla Eizenberg also chipped in with some fresh and flamboyant outfits (see: the Older Woman’s skin-tight leopard print dress). It wasn’t long after the curtain opened that the passengers began to arrive: Bill (Terrence Chin-Loy) and Tina (Sara Papini), a married couple going on holiday to rediscover romance; a cynical Older Woman (Melanie Ashkar) waiting (supposedly) for a younger man who is (supposedly) her fiance; and a pregnant woman (Kelly Clarke) and her husband (Miloslav Antonov) en route to Minsk. There is also a Steward (Sean Sullivan) and Stewardess (Maya Yahav Gour), who find creative ways to escape the tedium of the terminal; and a Refugee (Gon Halevi), whose character is based on the true story of an Iranian refugee trapped and living in a French airport. After the Controller announces that an incoming electrical storm will delay all outbound flights (“Due to circumstances beyond our control…”), the drama really takes off. The Refugee gives the passengers a “magical stone” with which to make wishes. Bill, after being chastised by his wife for being too predictable, goes off with the steward to “explore” the control tower. The women and the refugee decide to get drunk, and, as they become more garrulous, the women discover that each of them has “the” stone. They vent their anger, with dire consequences for the refugee. The singers shine throughout the act, taking quick turns delivering strong vocal performances. By the morning, the storm breaks, giving way to a succession of jaw-dropping surprises: Bill and the Steward have a surprise for their partners; Tina has a nasty surprise for Bill; the Refugee has a surprise for the women; the (soon-not-to-be) pregnant woman has a surprise for everyone. Then the flights are called, the passengers depart, and things start to quiet down. The audience can only hope that the next time they experience a flight delay, the wait will be even a fraction as entertaining as the wait in Flight.